Venue Carville Seniors Centre, Corner Albury and Diprose St.s Pimlico. Free Public talk Friday night, topic To be announced. Public talk Saturday $15 topic TBA. Free Calm Abiding Meditation and Mindfulness Tuesday 26 February 7 – 8 pm. Please join us for a free session of Calm Abiding Meditation and Mindfulness. If you’ve been affected by the recent floods or just need to find some calm and peace of mind, please come along. Meditation and Mindfulness can help calm your mind and give you the tools to deal with stress. Calm Abiding Meditation is practical and to be used during your day to help with calmness, it’s not just to be used when practicing at home or in meditation class. The meditation is divided into three parts, sitting, walking and another sitting session. We have cushions to sit on or you can use a chair if this is more comfortable. If you travel straight ahead through main JCU entrance for nearly 1 k. you’ll see on the right, St Marks College. Do u turn and about 100m on take first turn left, MONKHOUE ROAD, Chaplaincy is the low set brick build about 50 m on the left. We’re in Room DE 001, Bldg. 131 at end of Chaplaincy Building near to the Child Care Centre. People of all faiths welcome. NOW AN ORDAINED BUDDHIST MONK, ‘NGAWANG TENZIN’, WILL SPEAK ABOUT HIS JOURNEY TO BECOMING ORDAINED. Hear him speak of his travels which took him to Norway, Brazil, France, culminating in his becoming a fully ordained monk. His journey began here at JCU, Chaplaincy in 2009. THREE DAY CALM ABIDING AND MINDFULNESS RETREAT WITH TIBETAN LAMA CHOEDAK. Three Day Calm Abiding Meditation Retreat, and Teachings on Healing Goddess Parnashavari. with Tibetan Lama Choedak, Rinpoche. Paluma is 1000 m.habove sea level and mist rolls in late afternoon. Calm Abiding Meditation is the most fundamental of all Buddhist meditation practices. Using the tool of mindfulness one learns to bring a sense of stability and clarity to the mind. An increase in emotional stability and decrease in mental confusion will help negotiate more helpful responses when confronted with life problems. Meditation is ultimately about experiencing the opening up of our heart and mind to compassion and to wisdom. In this years retreat lama Choedak Rinpoche will also be giving teaching on Healing Goddess Parnashavari. Meditation should be learnt properly from a good teacher and practice far away from noise and distraction until one has developed a solid discipline to do it in everyday life. The amazing benefits of meditation can help to understand how to live sanely and wisely without being adversely affected by the fast pace of the modern world. Being able to stay calm, focused and learn to use simple but profound techniques of meditation can change one’s life. In this retreat, Lama Choedak Rinpoche will bestow the sacred transmission of the Healing Goddess Parnashavari and Lead its meditation and give teachings as part of the weekend retreat. This practice is ideal for all who are under medication and all health care practitioners can augment and benefit their practices. He has excellent English, speaking with great clarity, insight and compassion. Lama Choedak Rinpoche is the most prominent Tibetan Buddhist Lama living and teaching in Australia for the last 33 years. As a graduate of ANU, he is an author, translator and an effective communicator. He has founded many Buddhist centres in Australia. Meditation is an amazing practice of how to be present, to know, to see and change at will with the application of an immense power to love and live with kindness and wisdom. This power of good remains dormant in all human beings. Buddhist meditation shows how to unfold this from within. This technique goes back some 2600 years of ancient wisdom and enlightenment. Come and learn to meditate with a Tibetan Lama for a day. It will take form of listening to few short discourses, sitting, walking, standing and doing things with your hand. You will something valuable that will give tools to mend many broken areas of your life and help those around you. Private interviews will be available with Lama Choedak. This is a quiet village nestled in rain forest. The retreat is a residential one with accommodation in cottages at Paluma. Teachings will be in the Paluma Community Hall. Vegetarian food, for Breakfast, Lunch and Dinner. $400 for members, $425 for non members. Cost includes Accommodation, vegetarian food and Teachings. Please book early as there is limited accommodation and the nearest camping is 26 k away over a dirt road. The road to Paluma is bitumen. THREE DAY CALM ABIDING AND MINDFULNESS RETREAT, WITH TIBETANLAMA CHOEDAK. ALSO TEACHINGS ON HEALING MEDICINE BUDDHA. Lama will also give Teachings and empowerment on the practice of Healing Medicine Buddha. 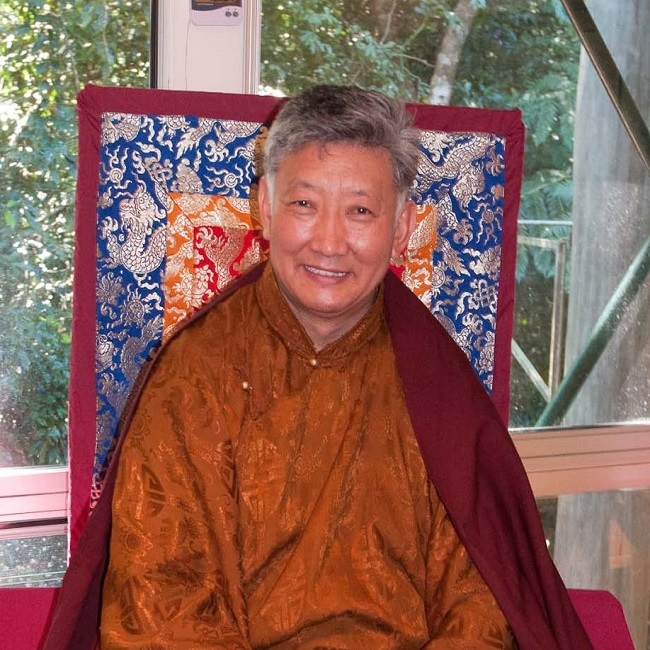 Lama Choedak is Tibetan born and has been teaching in Australia for 30 years. Lama Choedak Rinpoche is the most prominent Tibetan Buddhist Lama living and teaching in Australia for the last 28 years. As a graduate of ANU, he is an author, translator and an effective communicator. He has founded many Buddhist centres in Australia. He has just returned from one month of translation of Lamdre teachings by HH Sakya Trizin in Malaysia, attended by 600 people from 24 countries. Sickness is a common suffering of all living beings. However, according to Tibetan medicine, most illnesses are psychosomatic. Ill health that is generated by one’s unwholesome attitude cannot be cured by conventional medicine alone. This will help you understand how certain mind states can contribute to ill health, and to learn how to apply the appropriate antidotes. Discover the connection between thoughts, behaviour and speech, and the positive and negative effects they have on your health. Lama Choedak Rinpoche will give the empowerment of the Healing Medicine Buddha and impart the transmission of the healing mantra passed down through an unbroken lineage since the time of the Buddha. This will provide a complete training in practical as well as theoretical session on how to do the Healing Buddha’s meditation. You will also learn how to use it to assist friends and relatives who may be ill or dying. This profound meditation technique will compliment any form of medical treatment. This practice can reduce the side effects and increase the effectiveness of any medication. It is especially recommended for health professionals and those who are interested in learning self-healing. Paluma, 80 K from Townsville, North Queensland. $395 for members, $425 for non members. Learn mindfulness of body, feeling and thought. Learn to deal with the ups and downs of daily life and remain calm! Venue: Chaplaincy Building 131 James Cook University. Cost per lesson: $10 /pensioners $5. ex Yabulu workers and family, free. prominent Tibetan Buddhist masters living and teaching in Australia, sometimes assisting HH Dalai Lama in panel discussions and translating for HH Sakya Trizin. As the most successful teacher, Rinpoche has founded 20 Buddhist centres, institutions and retreat centres in Australia. His 27 years of teaching experience brings the best Buddhist wisdom has to offer to everyone’s lives. The Thirty Seven Practices of the Bodhisattva is an excellent master piece composed by Gyalsay Ngulchu Thokme (1295-1369). It is a versified text that His Holiness Dalai Lama teaches at the beginning of most Kalachakra teachings. His Holiness says ‘this text contains the whole Buddhist path in a nutshell’. Lama Choedak Rinpoche, who heard the teaching from HH Dalai Lama in 1971 still carries with him a calligraphed copy of the text. Rinpoche will offer elucidating commentary relevant to the contemporary world on this 15th century Buddhist poetry. This poetry is often on the lips of Lamas and adepts. You will learn profound and practical living skills through compassion and wisdom. Parnashavari practice will complement and induce the effectiveness of any medications. Venue: Carville Seniors Hall, Cnr Diprose & Albury Sts. Pimlico, Townsville 4812. Costs: Saturday Evening $15/10 concession. PLEASE NOTE: MORNING TEA PROVIDED BUT PLEASE BYO LUNCH.